And lo, on the 33,215th day, God said, “Let there be found a prop from a silent biblical film.” And so, once humans did the math and realized God was referring to 91 years later, they went ahead and did exactly that. Be of good cheer, ye fans of Cecil B. DeMille, for in this, the most 2014th year of our Lord yet, archaeologists have uncovered a giant sphinx used as a prop in the 1923 silent film The Ten Commandments. The sphinx is 15 feet tall, one of 21 that appear onscreen, lining the path to Pharaoh’s City. It was discovered buried in the sand dunes of Guadalupe, California, where the epic was shot. The excavation had actually planned to try and dig out the body of a different sphinx, whose detached head was found two years prior. (Though it hasn’t been confirmed, let’s just go ahead and speculate that the sphinx had some serious gambling debts, and that the decapitation was payback.) Instead, the archaeology team unearthed a second one, which is missing only part of its face due to nearly a century of weather damage. The sphinxes were built in Los Angeles, transported 165 miles to Guadalupe, then fully assembled on set. 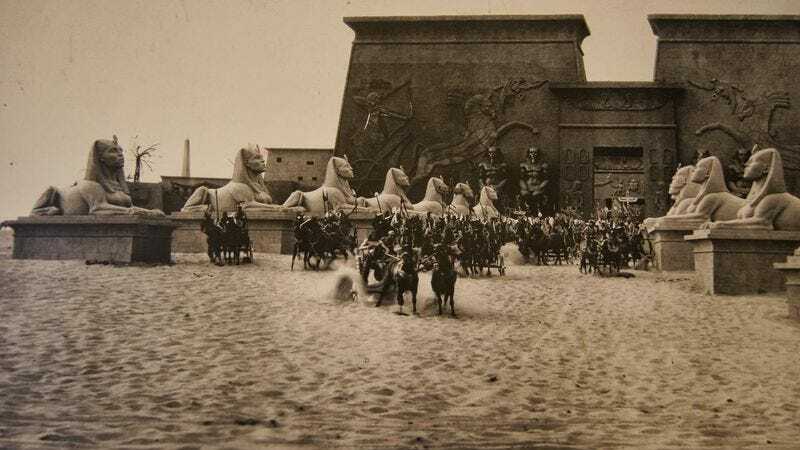 Contrary to urban legend—which says that DeMille’s film crew blew up the set after shooting wrapped, and buried the sphinxes in a trench (no doubt employed by those same sphinx-debt-collecting thugs)—that doesn’t appear to be the case. Doug Jenzen, executive director of the Guadalupe-Nipomo Dunes Center and the man behind the dig, offered the much less exciting, but probably far more accurate theory that the set simply collapsed over time, and was buried in the dunes via rain and sand exposure. Once reconstruction is complete, the sphinx will be displayed alongside the previously recovered head at the Dunes Center later next year.